Women are a formidable force in the growth of contemporary studio glass, despite the challenges they face receiving a level of recognition their male counterparts enjoy. This exhibit examines select female artists speaking with distinct viewpoints on social issues of politics, gender biases, stereotypes, and environmental concerns. Contemporary artists on view include the grande dame of contemporary studio glass, Audrey Handler, as well as Susan Taylor Glasgow, Beth Lipman, Lisa Koch, Stephanie Trenchard, Carmen Lozar, Kristin Thielking, Deanna Clayton, Lisa Beth Robinson, and Jennifer Caldwell. 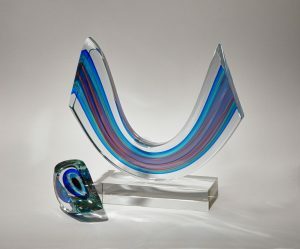 Audrey Handler is one of the first female students in the University of Wisconsin-Madison Glass Program under Harvey Littleton and a founding member of the Glass Art Society. 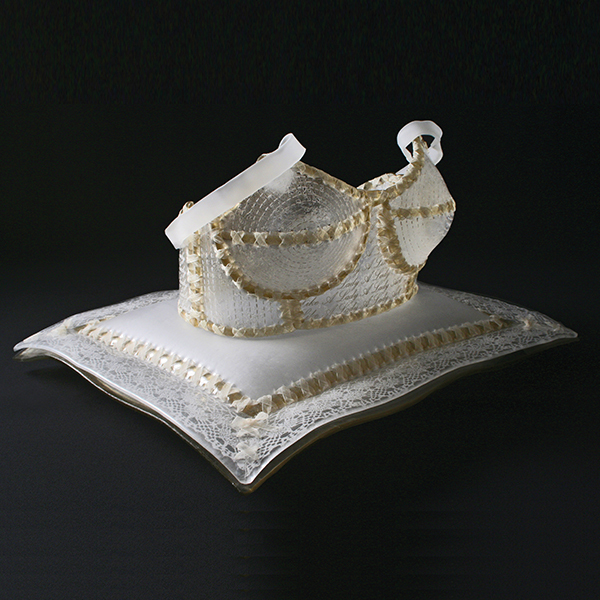 She began her studies in 1964 and continues to make work from her Verona studio. We will be honoring her and her work as a separate focus during this time. As one of the first women of glass, she helped to break the proverbial glass ceiling for the celebrated women working today and we are glad to have her in Wisconsin. Museums rely heavily on gifts of time, talent and treasure. Treasures from generous patrons, who were once passionate owners of incredible pieces of history, art or specimens of some sort, make up the dominant portion of the collections experienced on view in most museums. Limited acquisition budgets for the most part, create the selective few objects that are able to be very selectively purchased. It is this generosity, curiosity and patronage that is celebrated in This Just In! 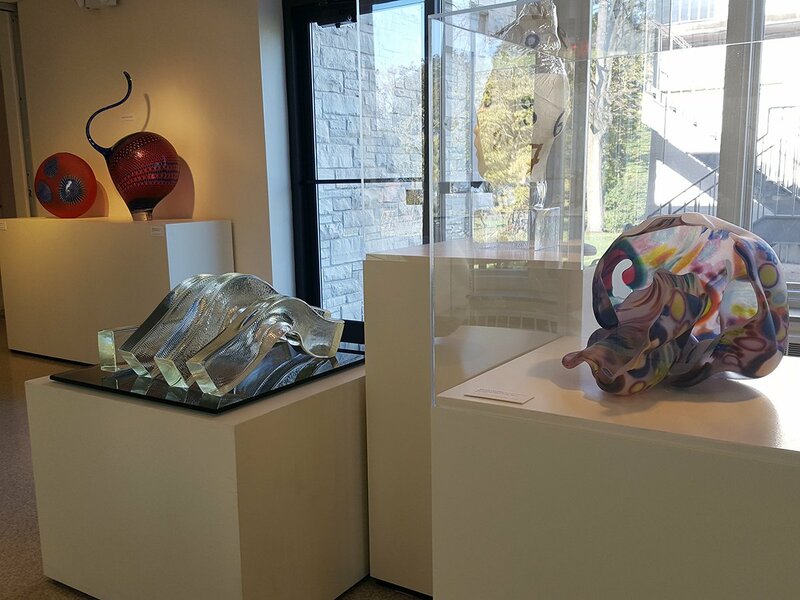 In 2017 and 2018, Bergstrom-Mahler Museum of Glass was offered a number of contemporary glass sculptural objects from a variety of patrons to expand its contemporary glass collection. 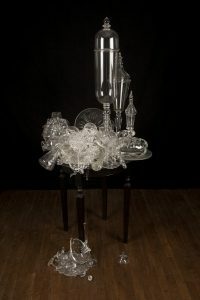 A selection of these gifts will be on view adding new dimension to the exploration of contemporary glass as art at Bergstrom-Mahler Museum of Glass. 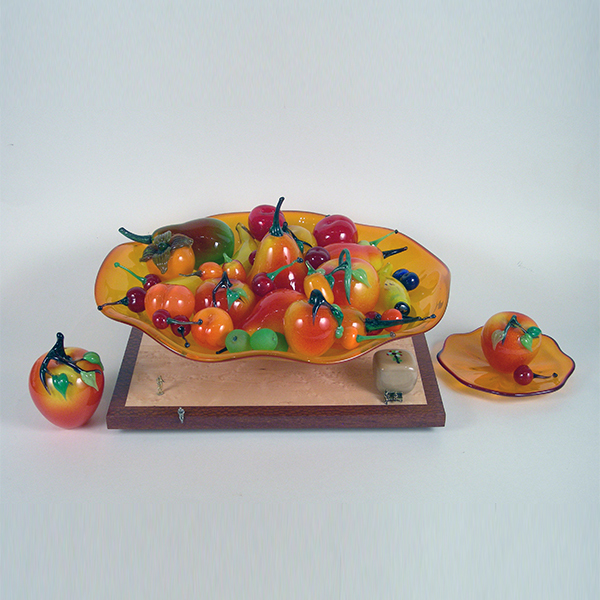 All of the museum’s collections began through gifts and the Contemporary Studio Glass Collection began with a gift in 1991 by Don and Carol Wiiken. The collection has continued to grow through gift, primarily and a few purchases. 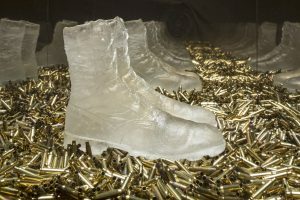 In this featured exhibition, new acquisitions include: works by Dale Chihuly, Harvey Littleton, Richard Royal, Stephen Rolfe Powell, Jose Chardiet, Ke’Ke’ Cribbs, Clifford Rainey, Jon Kuhn, Emily Brock and Therman Statom, Richard Jolley and many others, sharing over 30 works by contemporary artists. In 2017, a major gift came from the Herbert and Jane Rozoff Collection of 25 contemporary works in glass. The collection offers a personal selection reflecting their relationship with some of the artists, as well as gallery owners who carried their work. When searching for a home for these beloved pieces, Bergstrom-Mahler Museum of Glass was recommended by another contemporary glass collecting friend with whom the museum has had a long relationship and the match was made. 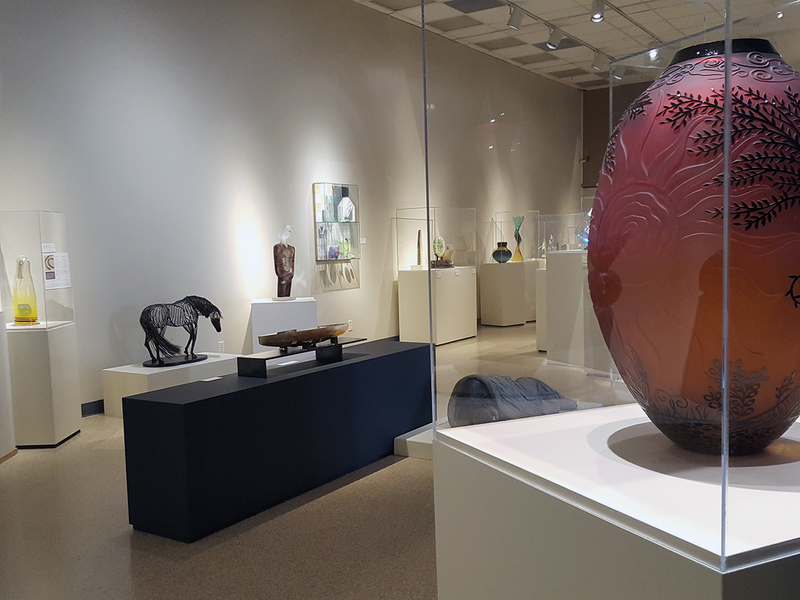 Additional gifts were made that continue to build the depth of the museum collection through Bergstrom-Mahler Museum of Glass’ association with contemporary glass collectors in the Midwest. Bruce and Judy Bendoff, Chickee and Steven Rosen, Bonnie Marx, Barry and Donna Rice, Jane Humzy and Peter Debreceny, Jacob and Molly Fishman and as well as, Burt and Libby Hoffman are among those who have expanded the museum collections recently through generous contributions. This exhibition offers highlights from those gifts, sharing the intention of these generous donors with our audience. 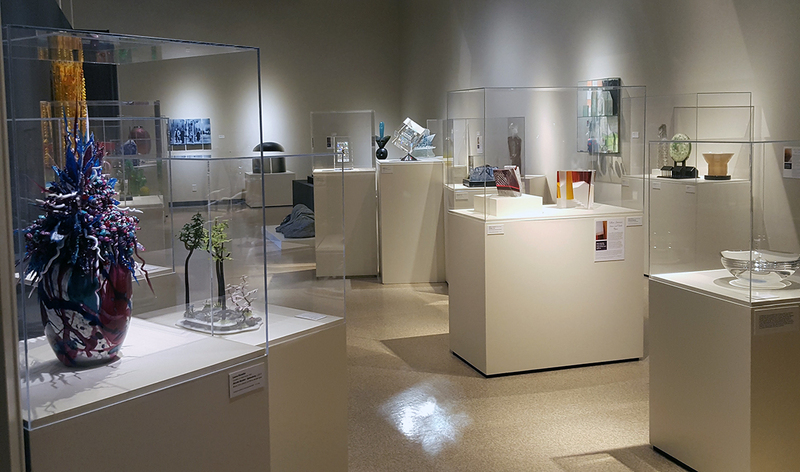 The Searching for Excellence exhibition includes a curated selection of approximately 50 contemporary glass objects from private collections located throughout the Midwest. Through the representation of objects from private collections, this exhibit explores how private collectors assist museums in building collections for the public benefit. The exhibit includes works from founders of the Studio Glass Movement up to and including contemporary masters. 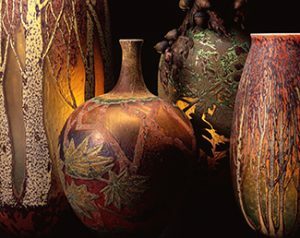 Represented artists include Dale Chihuly, Harvey Littleton, Lino Tagliapietra, William Morris, Paul Stankard and others. 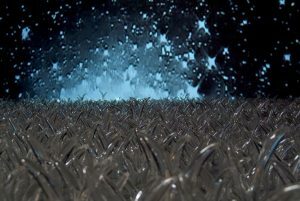 Quantum is about experiences with natural phenomena and a sense of scale: both large and small. It is about transient matter, such as light and time, and how they evolve. The artists have created an immersive scene that engages our senses through glass surfaces, video projections with flickering light, as well as atmospheric sound designed to suggest changes in light and time. 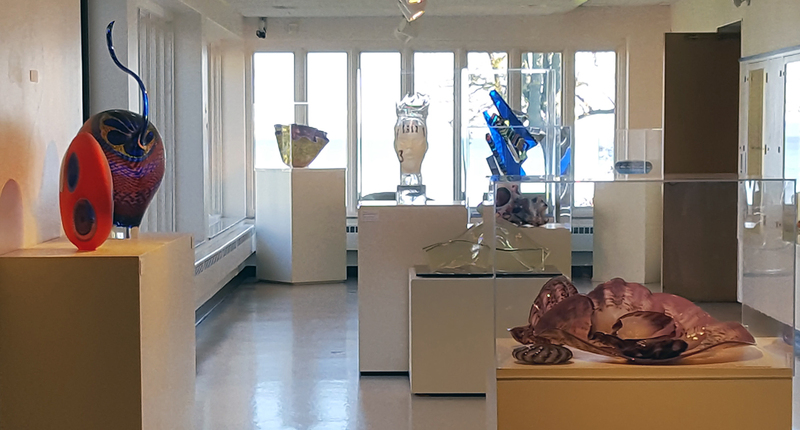 The Fox Valley Area High School Glass Exhibition at Bergstrom-Mahler Museum of Glass opened on Saturday, March 4th to showcase talented young area artists and celebrate national Youth Art Month. The museum offered schools an opportunity to bring students to the museum to work in The Glass Studio with artists, Sarah Rezin, Beth Wenger Johnstone, Jed Schleisner, Tom Galbraith and Megan Wagner. Over the past several weeks 242 students from 16 area schools created work for the exhibition including: Appleton West, Berlin, Chilton, Freedom, Menasha, Neenah, New London, Omro, Oshkosh North, Oshkosh West, Renaissance, St. Mary Catholic, Seymour, Stockbridge, Valders, and Xavier. 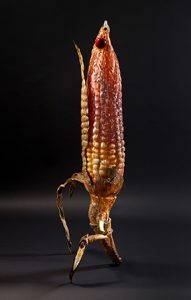 Throughout the months of January and February, students worked in the glass studio creating objects using flame working techniques to make beads and Borosilicate glass to create detailed sculptures. As students worked with neon artist, Jed Schleisner, they bent glass tubing over a torch to create a lighted sculpture filled with Krypton and Neon. Students experimented with a variety of fused glass methods including open weave fusing, reactive glass techniques, whereby specific glasses are layered on top of one another to create color reactions with the metals in the different glass layers. Students also included copper foil and wire in their creations. The majority of the works exhibited were created during these workshops. Additional artwork created at the schools was also on display. Bending Brilliance: Neon and Plasma Sculpture is an exhibition of works by artists who use light as their medium. 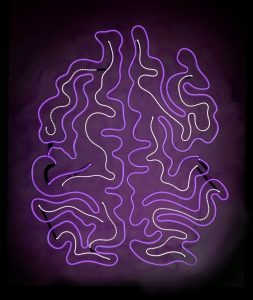 Since the early 20th century, neon lights have been used in advertising signage. From those beginnings the art form has evolved to include works by artists who use light, dark and shadow to transform an environment, create a composition or extend the familiar genre of signage to playful use of puns and thought-provoking themes. In this exhibit, view work from neon artists who play with light and illumination. In the kinetic plasma sculptures science and art blend to provide a sense of animation, science fiction and wonder for the viewer. Together, these artists provide a magical and whimsical combination of individual styles. weaving together threads to create a new whole. Art is a powerful tool that has equipped Jeffrey Stenbom, and Iraq War veteran, with a language to speak beyond the words of destruction and proffer healing. Stenbom immerses you, the viewer, in a world of artifacts and remnants devoid of identity in order to place you, in the middle of the action. You stand in the footprints of the soldier; you become the Unknown Soldier. His repurposed uniforms are woven into a universal symbol for which they stand. Thank You is an installation that can speak to all of us, not just warriors or veterans, but to those who have suffered and overcome grief, anguish, desperation and deep despair. 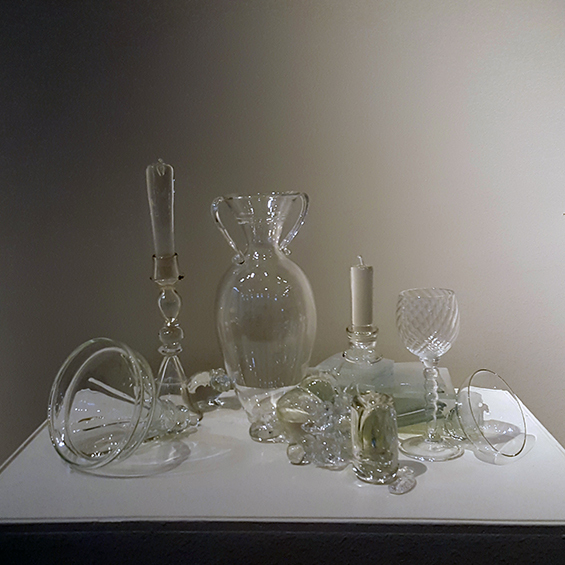 Bergstrom-Mahler Museum of Glass has examined the medium of glass for its functional, decorative as well as gloriously sculptural capabilities of playing with light for many years, and is pleased to demonstrate the continuum. Here, Stenbom uses the method of installation art as a provocative means to immerse you into the space as a participant within a unified arrangement of objects assembled to create meaning. As a contemporary material, glass is capable of using its properties of transparency, translucency, opacity, strength and fragility to transform a message into something deeply meaningful. Throughout the centuries of its use, glass has been an alluring material that has amazed the maker and the beguiled the beholder. We invite you to absorb its poignant message through its transformational properties. Since the mysterious lure of the glass factory on the Island of Murano drew him in at the age of 11, glass has been intertwined with his soul. Lino Tagliapietra earned the honor of Maestro by the time he was 25. Over the course of his illustrious career, he has traveled extensively, first sharing his Italian masterful techniques with Americans and they with him. This began with a visit to Murano by Dale Chihuly in 1968 and Lino followed with a visit to Pilchuck in 1978. The exchange has led to in an ever-changing exploration of glass as an expressive material: alive, flowing and boldly colorful. These results of unparalleled workmanship, continuous innovation, and collaboration can be seen in this exhibition of over 50 works by the Maestro. 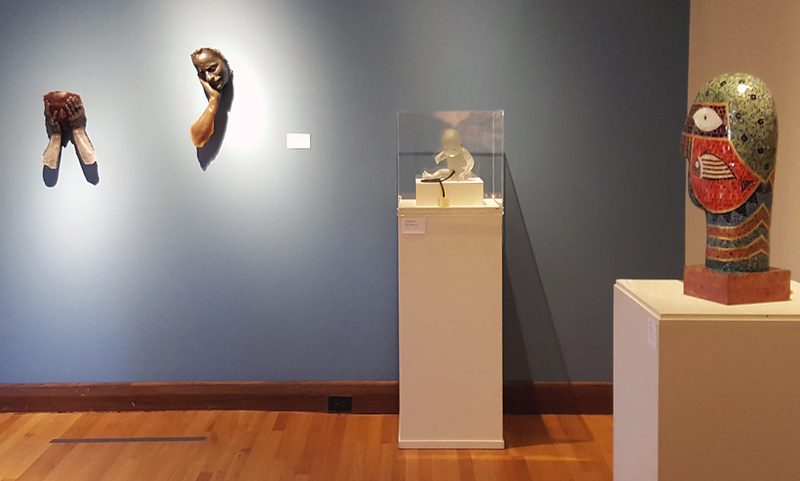 Works were on loan with the assistance of Schantz Gallery, Lino Tagliapietra, Inc. and private collections organized by Bergstrom-Mahler Museum of Glass. Throughout history, patrons of the Arts have brought the work of talented artists to the public. William Morris: Native Species demonstrates this modern story of collaboration and patronage between artist, William Morris, and collector, George R. Stroemple. 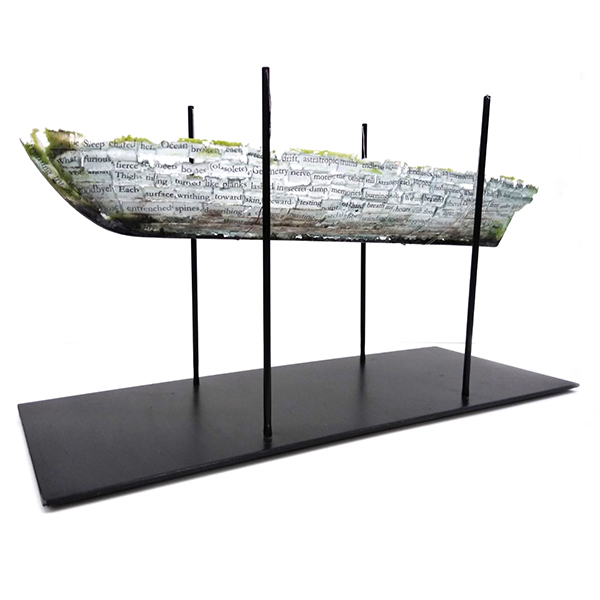 Morris and Stroemple, friends for many years, share a respect for the profound beauty of the natural world, which grew into the 2004 commission of 38 vessels inspired by the flora and fauna of the Pacific Northwest. Morris pays homage to the 19th century French Art Nouveau glass artist Emile Galle, as well as honors Stroemple’s request to consider the shapes and colors of the 19th century Japanese Meiji period objects he also collects. The resulting works adeptly articulate all of these references while retaining their own presence, intricately wrought with pine needles and cones, aspen trees, dragonflies, pheasants, ground squirrels, acorns, wild grasses, lizards, and cedar boughs. 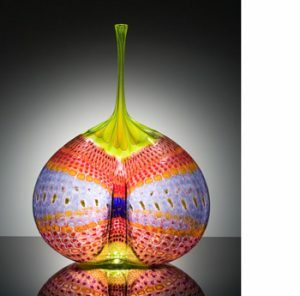 Beauty Beyond Nature: The Glass Art of Paul Stankard presents 70 works spanning the influential career of this artist from the private collection of Robert M. Minkoff. Minkoff encountered Paul Stankard’s work in 2005, and in a brief period built a definitive collection that has chronicled one artist’s creative journey in glass for us all. Retrospective: an Exhibition of Kiln-formed Glass, Organized by Bullseye Glass, Co. In 1974, two recent graduates from the University of Wisconsin and one from San Jose State University set up a glass factory in the backyard of a ramshackle house in Portland, Oregon. The Bullseye Glass Company was founded with collaboration and experimentation at its core. Forty years later this legacy is seen in the work of artists who have worked with Bullseye to develop new materials and techniques. 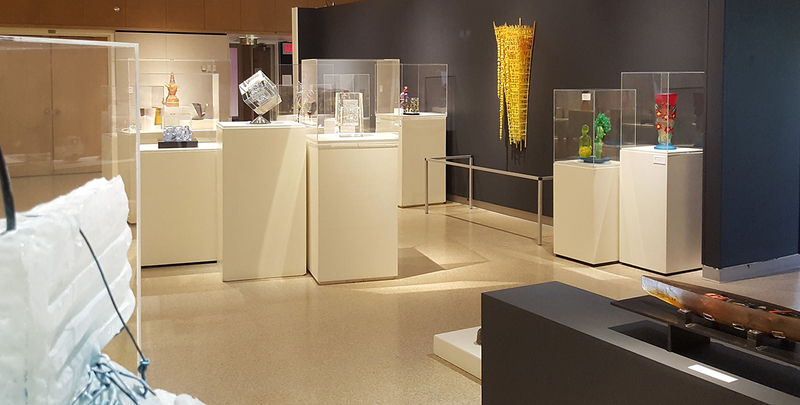 This exhibit features the creative and innovative work of nationally and internationally renowned glass artists who live and work in The New North region. 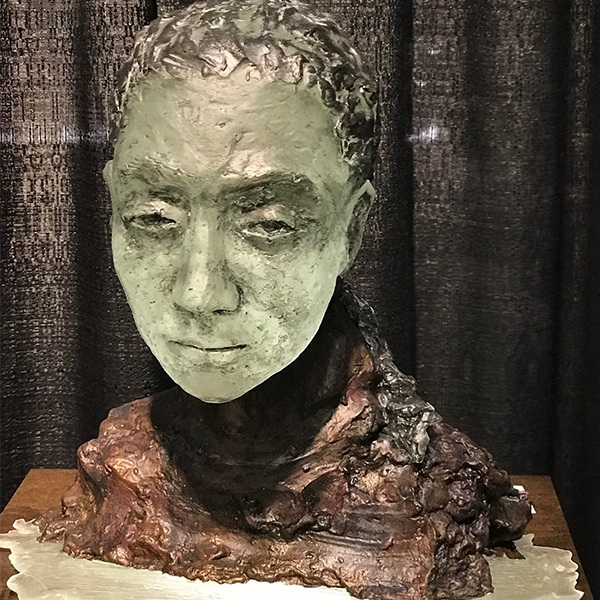 Within the Northeast Wisconsin area, there are a number of accomplished artists who are recognized for their capabilities of enriching the intellectual, economic and creative environments of the region. These artists have managed their own businesses as gallery owners, artist and entrepreneurs, creating work for exhibit and sale to a national audience. The goal of this exhibition is to meld the interest in innovation in the business community with the creativity and innovation of the artists in our midst. Started in 1968 by Doug Johnson and taken over by Jon Engrebretson, the UW-River Falls glass program is one of the oldest BFA glass programs in the country. The program has produced countless talented and successful alumni. This exhibit focuses on the legacy started by early glass students as well as the work of more recent alumni. Button Bonanza features selections from the nearly 300 glass buttons from the estate of William H. Blanning of Washington, D.C. 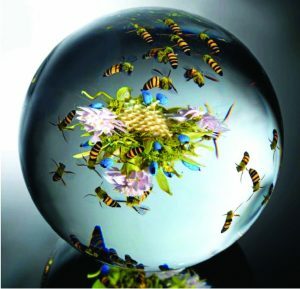 Many of the objects are stunning paperweight buttons, which as their name suggests, resemble glass paperweights in miniature form. 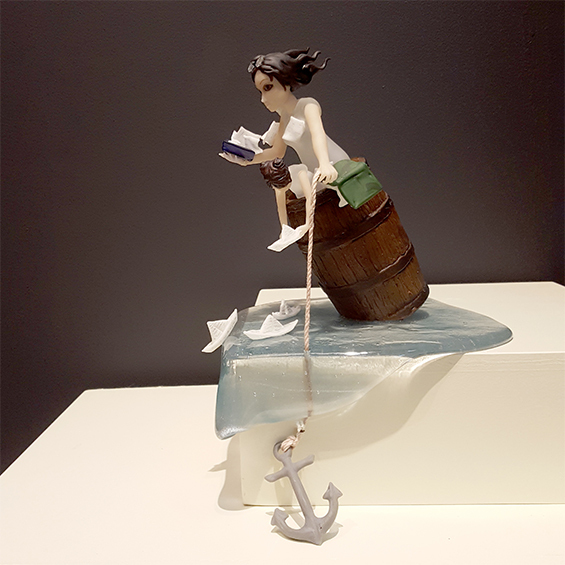 These tiny works of art demonstrate the incredible artistic and technical abilities of their makers. Artists featured in the exhibition include Charles Kaziun, John Gooderham, Ray Banford, and Ronald and Dorothy Hansen. This glass exhibition joined with 160 others across the nation in 2012 to celebrate Harvey K. Littleton and the founding of the American Studio Glass Movement. As a University of Wisconsin-Madison art professor in the early 1960s, Littleton began the first university glass program and forever changed how we view art through glass. Step into a comical world of 1950’s pop culture with Ricky Bernstein’s Kitchen Dreams. 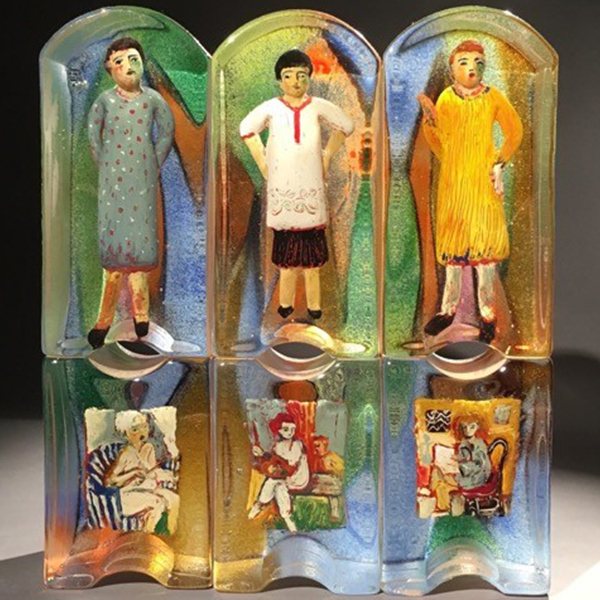 Using glass, aluminum and childhood memories, artist Ricky Bernstein pieces together everyday life through a caricature of social roles and cultural icons. 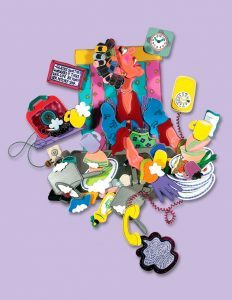 Bernstein’s life-sized collages animate a bold, bright, somewhat surreal world, bound to bring you a good belly laugh. 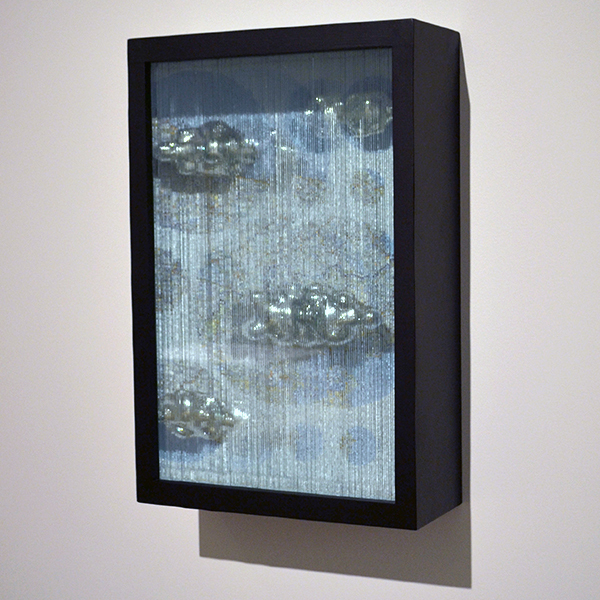 All That Glitters was based on the simplicity of form and glimmer of glass in contemporary cold-worked sculpture. Experience the sensuality of light as it is manipulated by artists and transformed into color and pattern. 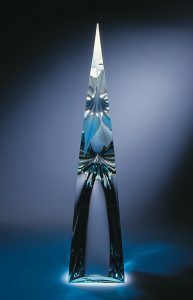 Artists were selected based on the visual effects of their sculpture and the common theme of working in cold glass methods: polishing, cutting, laminating and faceting, to exploit the reflective and transmissive qualities of light that glass manages like no other material, except perhaps, diamonds. Glass from the Habsburgs to the Czech Republic features the museum collections complemented by loans of other glass from Central Europe to develop a chronological view of some of the highest artistic achievements between 1573 to the present day.The exhibition showcases the exquisite collection of Germanic Glass drinking vessels given by Ernst and Carol Mahler, founding members and former presidents of the board of directors. 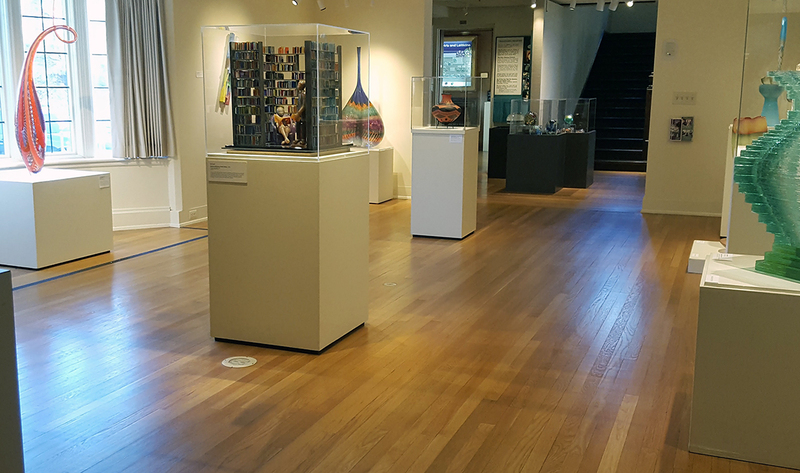 In addition, selections from the personal collection of Eric Kaplan and Barbara Moser of Moser Art Glass, created in Meierhofen near Karlsbad, as well as Bohemian and Czechoslovakian paperweights from the collection of Gary and Marge McClanahan are included in the exhibition. Contemporary Glass of Central Europe including Germany, the Czech Republic and Poland from five private collections will complete the timeline of artistic achievements in glass over a period of nearly 500 years. and now the work that artisans of Murano are presenting for glass artists to infuse into a new bold statement. Examples of the Italian influence in this exhibition are objects created with mosaic techniques from the Roman Empire of the mid first century B.C.E. to the mid first century. The influence continues to the paperweight form of the 19th century and carries through to the current period with the innovative work of the Venini, Barovier, and Seguso factories. 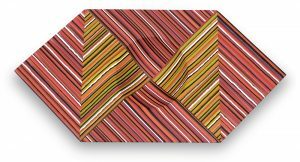 As before, these artists have influenced the work of contemporary glass artists such as Harvey Littleton, Dale Chihuly, Lino Tagliapietra and Richard Ritter, and others. Wisconsin artists include, Michael Meilahn, Wes Hunting, Jeremy Popelka and Charles Savoie.